"Bounty hunters. We don't need that scum." 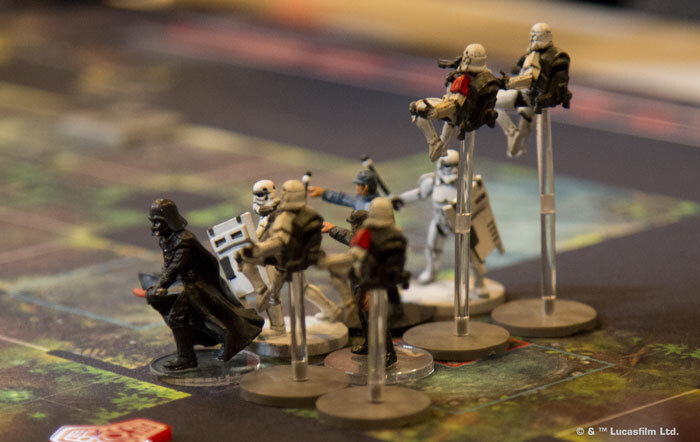 The skirmishes of Star Wars™: Imperial Assault Organized Play are a fast-paced balancing act of focused strategies and clever tactics. As you race your opponent to 40 victory points, you need to survey the ever-changing battlefield, think two steps ahead, and look for ways you might outmaneuver your rival. Sometimes you'll find opportunities to claim the lead by scoring valuable objectives. Sometimes you'll dispatch units to bait your opponent's forces out of position. Sometimes you'll simply want to focus on the kill. There's no other path to victory quite so visceral as launching a full-force assault against your opponent's army. It's not always the most effective path; you have to know when the odds are against you. But when you see the chance is there—or you just don't want anyone to tell you the odds—there's no more direct approach to victory than to focus on the kill. Accordingly, the 2018 Imperial Assault Season Four Tournament Kit comes with plenty of incentive to rush after your opponent's units and take them out of action! Whether you are primarily a fan of the campaign game or you're a dedicated skirmish player whose interest in Imperial Assault lies primarily with the battles you enjoy through the game's Organized Play events, the 2018 Season Four Tournament Kit's prizes will make a stunning addition to your game, quite likely elevating your play experience to a whole new level. 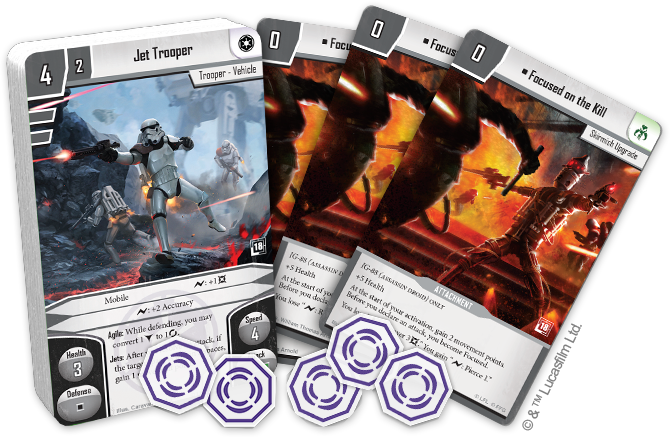 The Tournament Kit contains seventeen copies of an alternate art version of the Empire's Jet Troopers, illustrated by Caravan Studio. 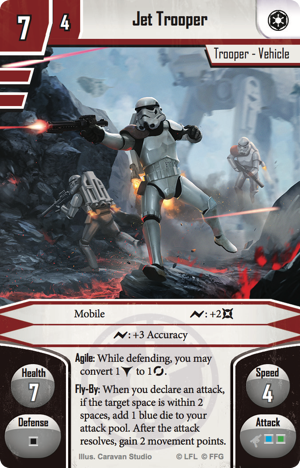 With the elite Jet Troopers on one side and the standard Jet Troopers on the other, this card's dynamic artwork hints at the impact your troopers can make on the battlefield. One copy of this card is intended for the tournament organizer to keep or distribute as he or she sees fit; the other sixteen are to be awarded to participants in the season's Organized Play. At an Entanglement tournament, the Top 16 players should each receive a copy. While you can certainly provide your Imperial army an incredible measure of mobility and tactical flexibility from the deployment of your Jet Trooper units, you may still, at times, find value in a less traditional approach—such as you might gain by sending out the call to some of the galaxy's most fearsome bounty hunters. 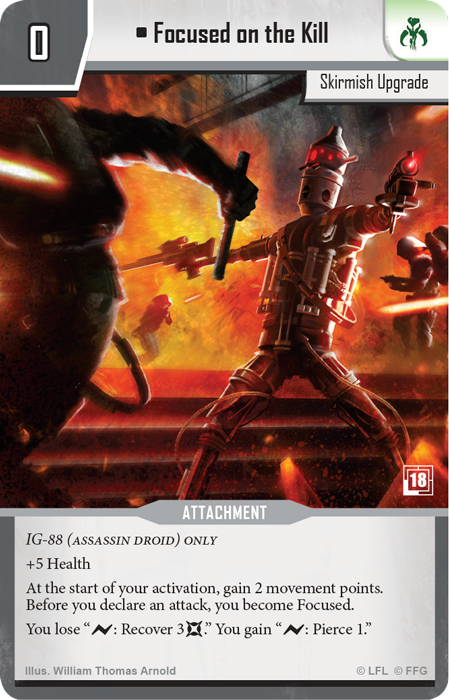 At these times, when you're willing to admit you might benefit from hiring the scum, or you simply throw in your lot with a whole Mercenary army, you can either demand your bounty hunters show some measure of restraint or free the deadliest of them—like the assassin droid IG-88—to use whatever means necessary as they Focus on the Kill. There are three copies of this alternate art skirmish upgrade card in each 2018 Season Four Tournament Kit. The art is provided by William Thomas Arnold, and one copy is intended for the tournament organizer. The other two are awarded as elite prizes. At an Entanglement tournament, these elite prizes are awarded to the top participants in the order of their finish, with each choosing to claim either one copy of this alternate art card or one set of the tokens awarded as the other elite prize. The 2018 Season Four Tournament Kit comes with two sets of stun tokens—each featuring purple paint on white acrylic. Each set contains five tokens—easily enough to wreak havoc upon your enemy's forces. Jet Troopers or IG-88? Complete your objectives or launch an all-out assault on your opponent's units? Use your prizes to decorate your skirmish armies or your campaign games? The choices are yours to make, but you can only make them on the battlefield—and only during Season Four Organized Play. Take part in this year's most explosive Star Wars skirmish battles. Talk to your favorite local game store about getting involved with Imperial Assault Organized Play!